comprehensive service offering and mobilise rapidly. 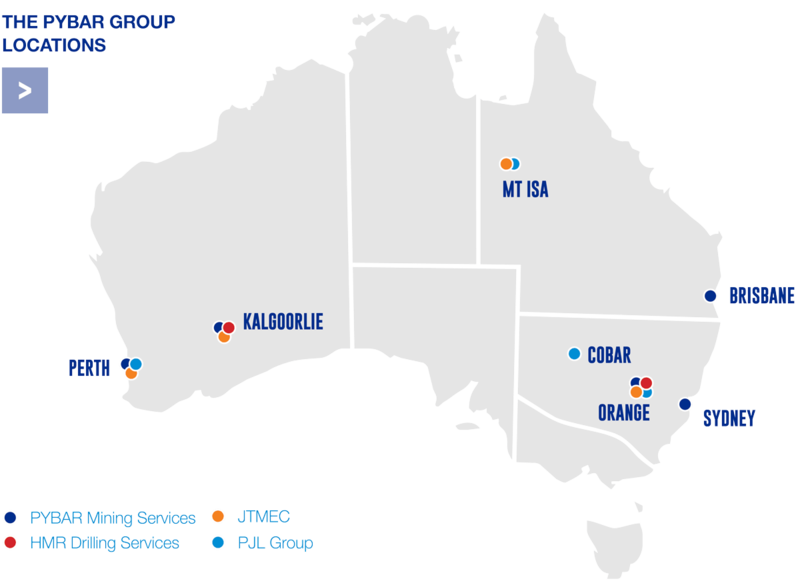 Founded in 1993, PYBAR Mining Services is the third largest underground hard rock mining contractor in Australia. Together with PYBAR Group companies, PYBAR provides a comprehensive service to the mining sector. The Group’s the wholly owned subsidiary, HMR Drilling Services provides specialist underground core drilling capability and surface exploration; whilst the majority owned JTMEC provides electrical design and construction. Affiliate company PJL Group is a mechanical and engineering business with core competencies in mining machinery and equipment rebuilds, maintenance, engineering and fabrication. PJL carries out PYBAR major equipment rebuilds. We have the agility and resources to provide a scalable, market leading underground mining service, nationally. With Group resources based in all major mining centres in Australia, PYBAR has the ability to provide a scalable and efficient market leading service to projects of any size. Collectively, the PYBAR Group employs over 1,000 employees to deliver exceptional standards in underground mining.